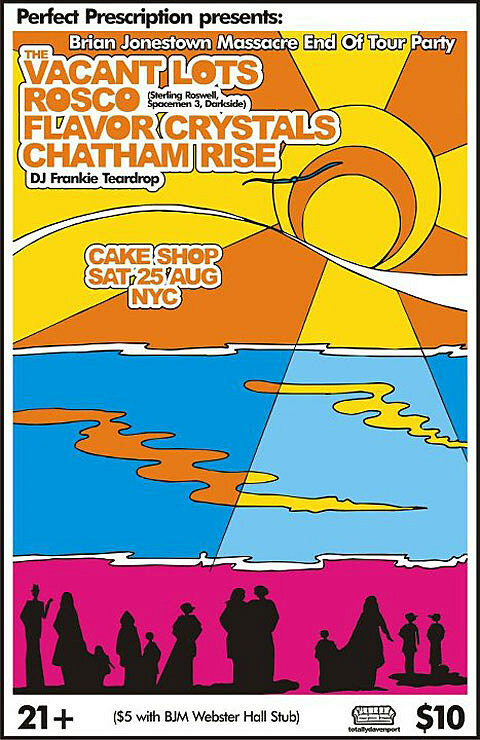 Upcoming shows at Cake Shop include Tiger Waves on August 10, Splash on August 11, and a Brian Jonewtown Massacre post-tour, post-Webster Hall-show party on August 25 with The Vacant Lots, Rosco (Sterling Roswell of Spacemen 3, The Darkside), Flavor Crystals, Chatham Rise, and DJ Frankie Teardrop of BJM ($10 or $5 with BJM Webster Hall ticket stub, 21+, 11pm-4am). Magic Castles open for the Brian Jonestown Massacre at Webster Hall earlier that night. Tickets are still on sale.